Another East Surrey Man Wounded. Mrs Ellis, wife of Private Jack Ellis of the 1st East Surreys, has received a letter from her husband stating that he has been wounded in the left arm and is at present lying at the Royal Herbert Hospital in Woolwich. The wounded man, in the course of an interesting letter, states that his wound is healing rapidly thanks to the kind attention of the doctors and nurses. The greatest luxury he found on arriving in England was a bed and, he humorously remarks "he made good use of it". Wounded Arrive from the Front. By the in-coming SS Sarnia last evening one of the soldiers who arrived was Private J Ellis of the 1st East Surreys, who was wounded in the left arm as previously reported in these columns, and who had been lying at the Royal Herbert Hospital in Woolwich. He received a warm welcome from his wife and relatives. Private Ellis of the East Surreys, who had been wounded in action, left by the steamer this morning. We wish this patriotic Jersey lad the best of luck and a safe return. Roll of Honour. The death occurred yesterday at 28 Albert Street of Private John Ellis of 1st East Surrey Regiment. The deceased soldier was stationed in the Island with the Regiment and married a local young woman. He saw considerable service in France and later in Serbia, but owing to being badly gassed and wounded he was invalided. 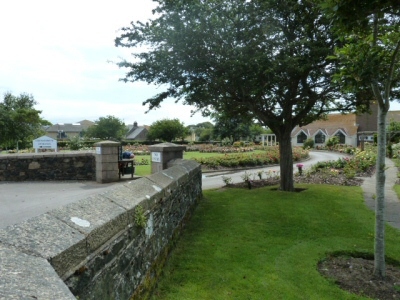 He returned to Jersey in June last and had been unwell for some time and since the cold weather it was evident that the gas has thoroughly affected his system and he could not shake it off. The late gallant soldier was 37 and leaves a widow and one child. All those who wish to pay their last respects to one who, though he has not died on the field of battle, has made the supreme sacrifice for his King and Country are invited to meet on Monday next at 2 o'clock at 28 Albert Street. Died in Jersey from Nephtitis, aged 37 years. 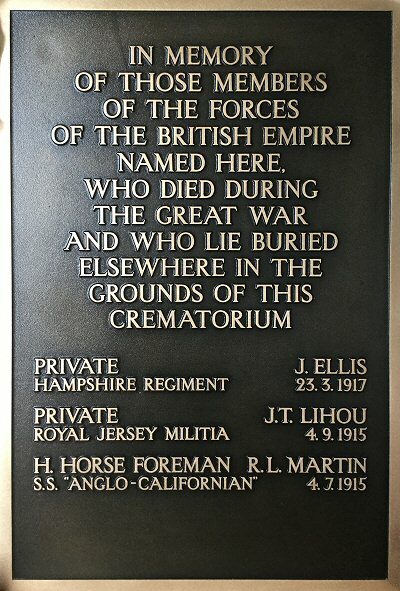 Buried at Westmount Strangers' Cemetery, St Helier, Jersey.